Good morning, Crafters! 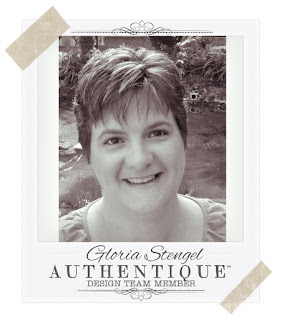 This is Gloria Stengel with you again. I have created an 8" x 8" scrapbook folder to share with you. 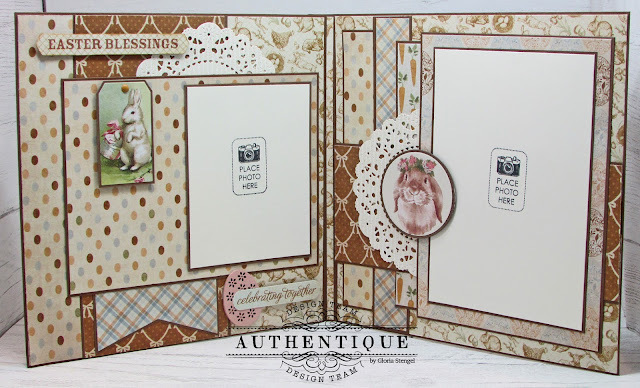 I created a version of this folder last year using the Lovestruck Collection (see it HERE). 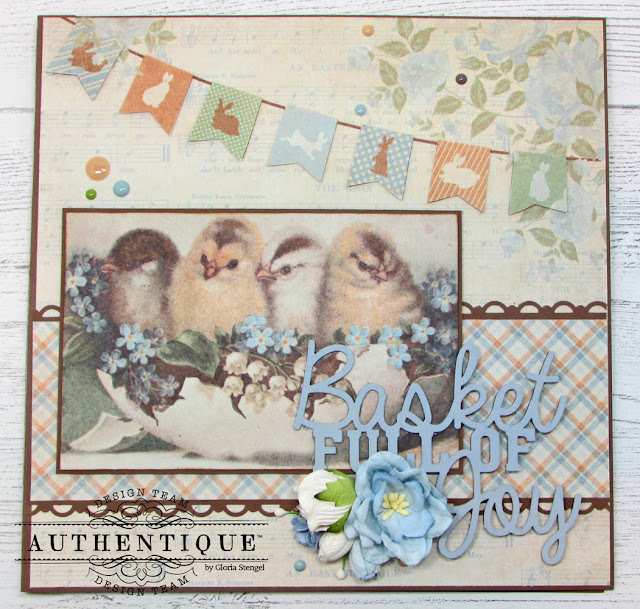 I love creating projects that can be re-made with other papers for a new holiday or occasion. I loved the Valentine project from last year so much that I wanted to make a new one with the NEW Abundant Collection papers. The inside of the folder has space for two photos, one that is 4 1/4" x 3 1/4" and the second photo that is 6" x 4". To create this folder, first cut one piece of brown cardstock to 8" x 8" inches. Cut a second piece of brown cardstock to 8" x 8 3/4" scored at 1/2" and 3/4" on the longer side. Attach the two pieces together to make an 8" x 8" folio with a 1/4" spine. Cut Abundant Four paper to 7 7/8" x 7 7/8", keeping the flower motif in the upper left corner of the paper. Attach the paper to the front of the folder. 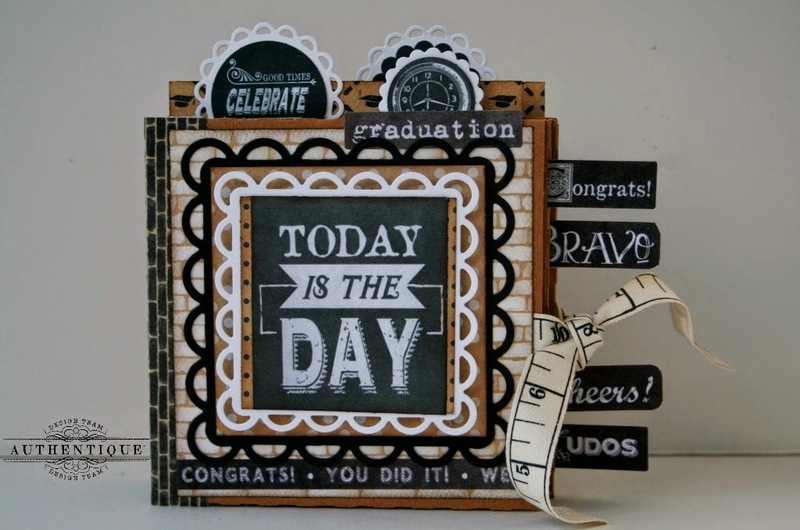 Cut brown cardstock to approximately 3" x 7 7/8" and use a decorative border punch to punch along both long edges. (I used a decorative scallop punch). Trim Abundant Three paper (plaid) to approximately 2 1/2" x 7 7/8" and attach to the center of the punched panel, as shown. Attach the panel to the folio 4" from the top edge. Trim the chicks image from Abundant Six paper and mat with brown cardstock. Add foam tape or chipboard scraps to the back of the image for dimension, then attach it to the folio as shown, approximately 2 3/4" from the top edge and 1/2" from the left edge. 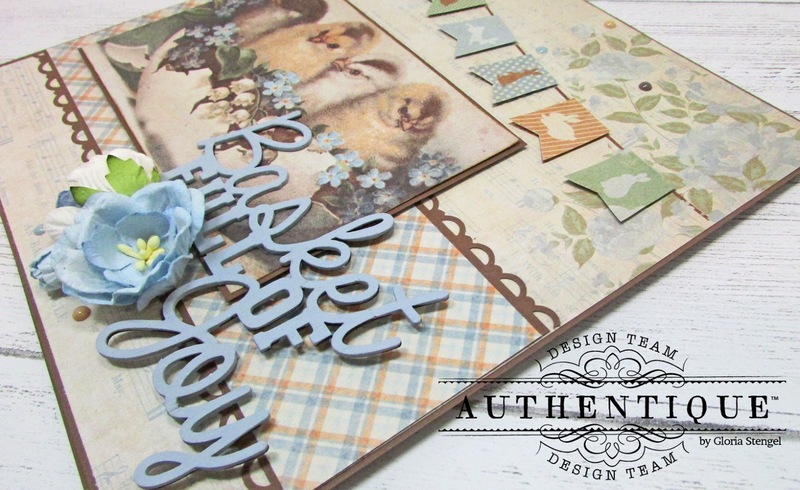 Find a chipboard (or die cut) phrase to decorate the front of your folio. I found a chipboard phrase in my stash and painted it to match the papers. To achieve the correct shade of blue I mixed approximately 1 tablespoon Deco Art Chalky Finish Yesteryear acrylic paint with one drop Plaid Folk Art Wicker White and one drop Plaid Apple Barrel Cobalt Blue paint. I gave the chipboard phrase a few coats of paint and then attached it to the folio with glue. I added a few paper flowers below the phrase. Fussy cut the banners from a second sheet of Abundant Four paper and use foam squares to attach them over the banners on the cover. Add a few enamel dots at random to the front cover. Cut Abundant Five (basket weave) paper to 7 7/8" x 7 7/8" and attach to the back of the folder (not shown). Cut another strip of Abundant Five (basket weave) paper to 7 7/8" x 3/16" and attach it to the spine of the folder. I have kept the back cover plain, but you may decorate it if you wish. Open the folder and begin to work on the inside. First trim a piece of Abundant Three (animals) paper to 7 7/8" x 4 1/2" and attach to the right side of the left panel. Trim another strip to 7 7/8" x 3/16" and attach to the gutter (spine) between the folio pages. Trim Abundant Five (ovals/eggs) paper to 7 7/8" x 2" and attach it to the left edge of the left-hand page. Trim Abundant Two (bows) paper to 7 7/8" x 3 3/4" and mat with brown cardstock cut to 7 7/8" x 3 7/8". Attach it to the left panel, overlapping the previous prints, approximately 1 1/4" from the left edge. 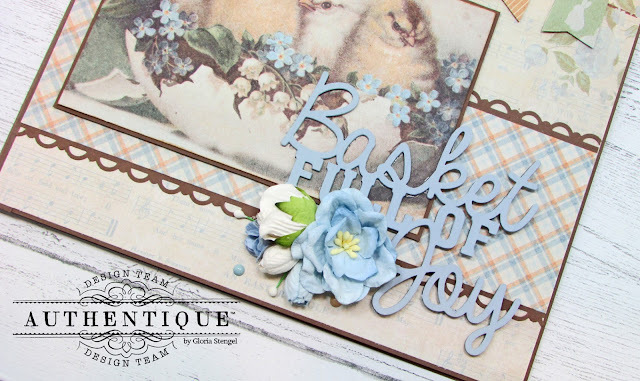 Use a die template to cut a large doily from Spectrum Antique Lace paper (or use a pre-made doily). Place the doily onto the page, approximately 1/8" from the top edge and 1 1/2" from the right side of the page. Use a die template to trim Abundant Three (plaid) paper into a banner shape. Mat with brown cardstock and attach to the bottom of the page, overlapping the center panel, as shown. Trim Abundant Five (ovals/eggs) paper to 5" x 6 3/4" and mat with brown cardstock cut to 5 1/8" x 6 7/8". Attach the panel to the page approximately 1 1/2" from the top and 1" from the left edge. Cut a photo mat from ivory cardstock, 4 1/4" x 3 1/4". Mat with brown cardstock cut to 4 3/8" x 3 3/8". Attach the photo mat to the right side of the panel. 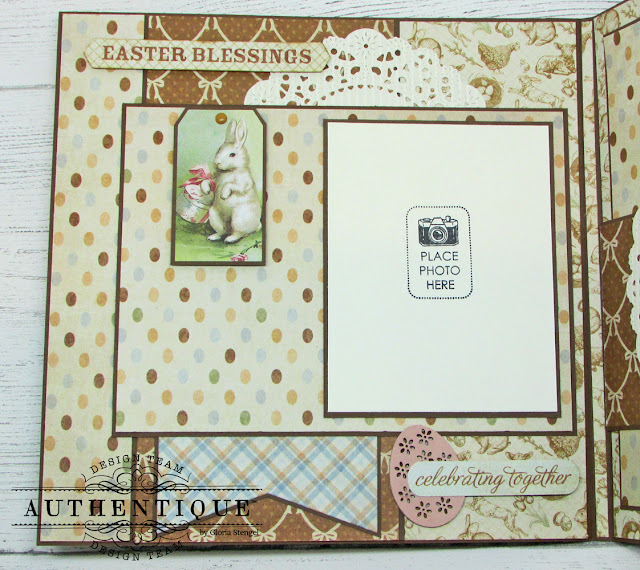 Attach the "Easter Blessings" punch out (from the Abundant Elements Cardstock Die Cut sheet) to the top left edge using foam squares. Paint a chipboard decorative egg in a pink color and glue to the bottom right corner of the page. Add the punch-out "celebrating together" sentiment as shown. 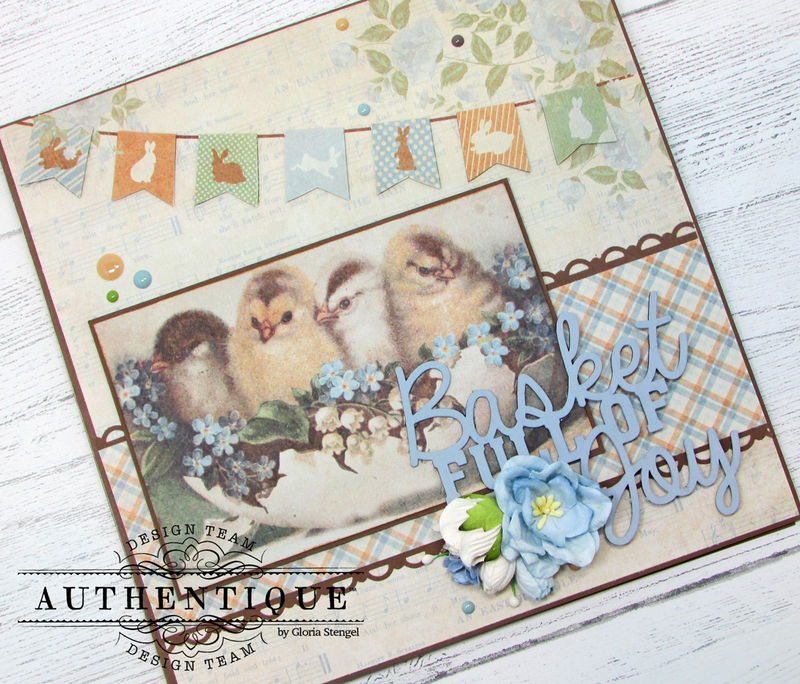 Mat an Easter Bunny sticker tag from the Jubilee Collection (2018 collection) with brown cardstock. Add a chocolate-colored brad and attach to the panel as shown. The page is finished! 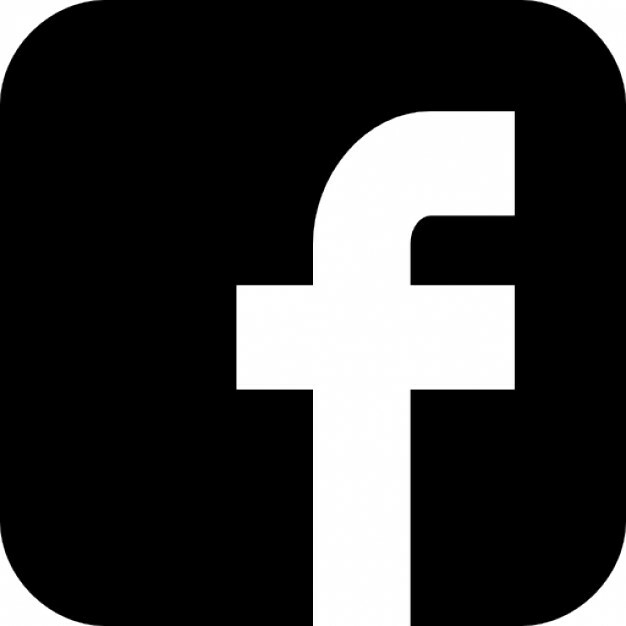 Add a photo to the photo mat. Now, let's work on page two! First trim a piece of Abundant Three (animals) paper to 7 7/8" x 7 7/8" and attach to the right inside panel. Trim three strips of paper: Abundant Five (ovals/eggs) at 7" x 1", Abundant Three (plaid) at 7 3/4" x 1", and Abundant Four (carrots) at 6 1/2" x 1". Mat all three strips with brown cardtock cut slightly larger. Attach the three strips to the left side of the page, as shown. Make sure to overlap each strip. Trim Abundant Two (bows) paper to 3" x 7 7/8" and mat with brown cardstock cut to 3 1/8" x 7 7/8". Attach to the page, 3 1/4" from the top edge. Use a die template to cut a large doily from Spectrum Antique Linen cardstock (or use a pre-made doily). Place the doily onto the page, approximately 2 1/8" from the top edge and 3/4" from the left edge. 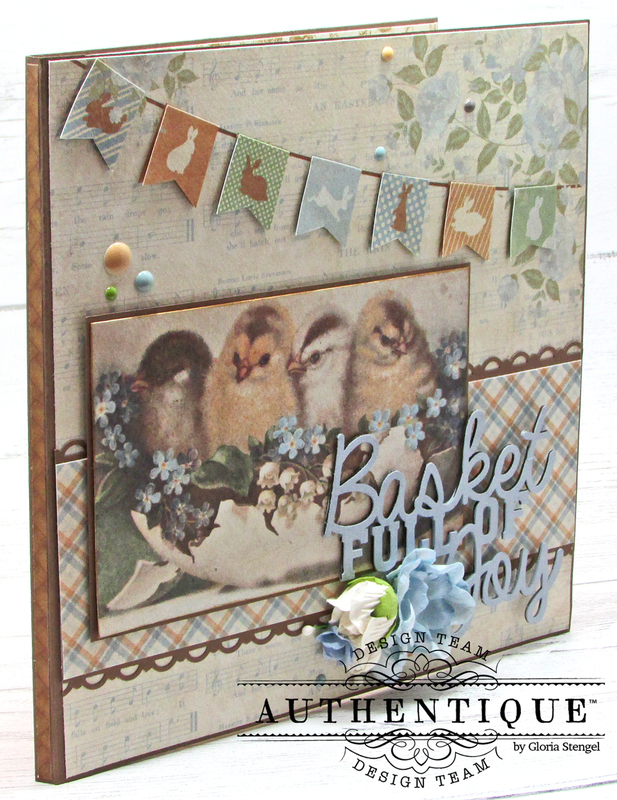 Trim Abundant One (decorative eggs) paper to 7" x 5" and mat with brown cardstock cut to 7 1/8" x 5 1/8". 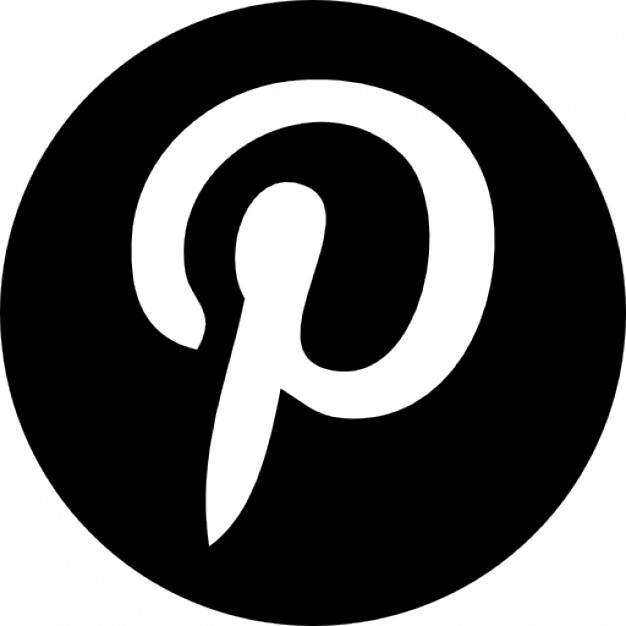 Attach to the page approximately 1/2" from the top and 1/2" from the right edge. Cut a photo mat from ivory cardstock, 6" x 4". Mat with brown cardstock cut to 6 1/8" x 4 1/8". Attach the photo mat to the center of the panel. Attach a bunny sticker from the Jubilee Collection (2018 collection) to brown cardstock and use a circle die to cut out the circle. Use foam adhesive to attach the bunny circle to the paper doily as shown. 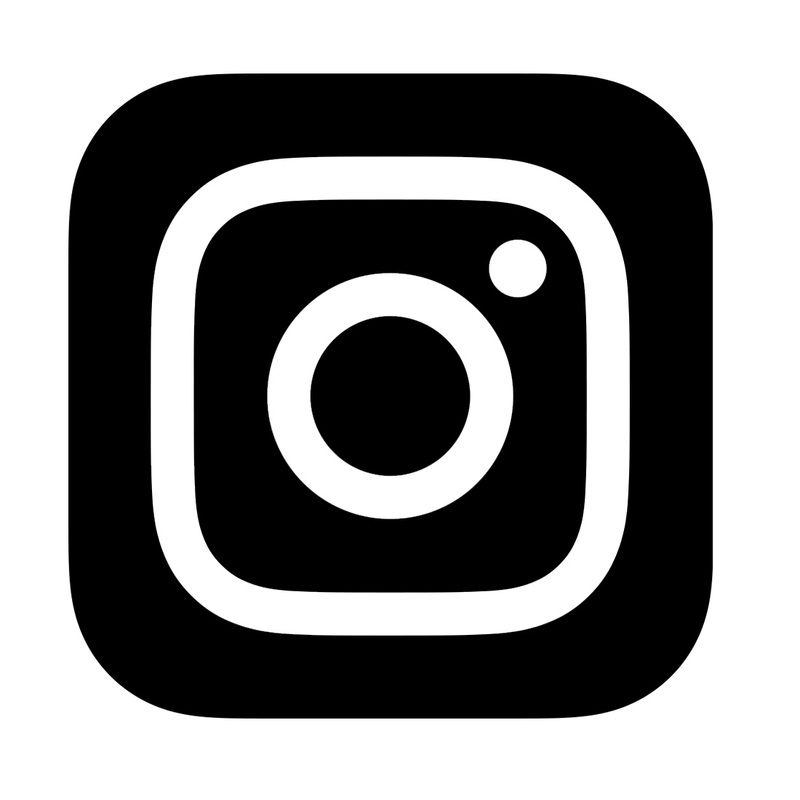 Make sure to only attach the bunny element on the left edge so as to enable you to slide your photo under it. 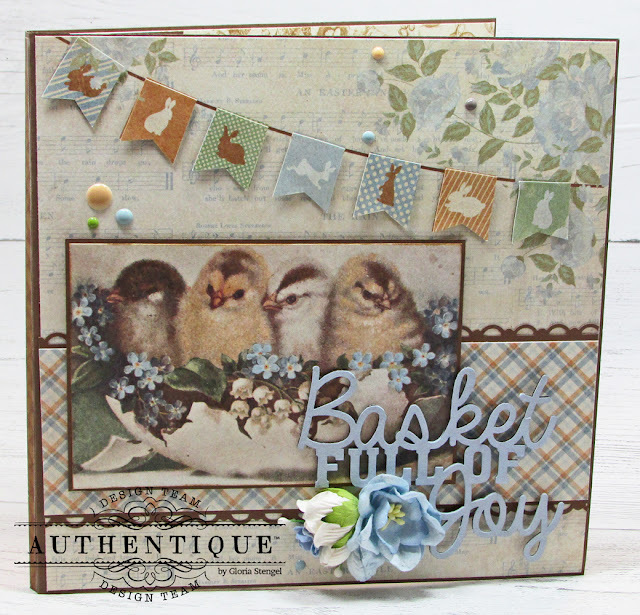 I hope you enjoyed making this cute, Easter-themed scrapbook folder! Thank you so much for looking!